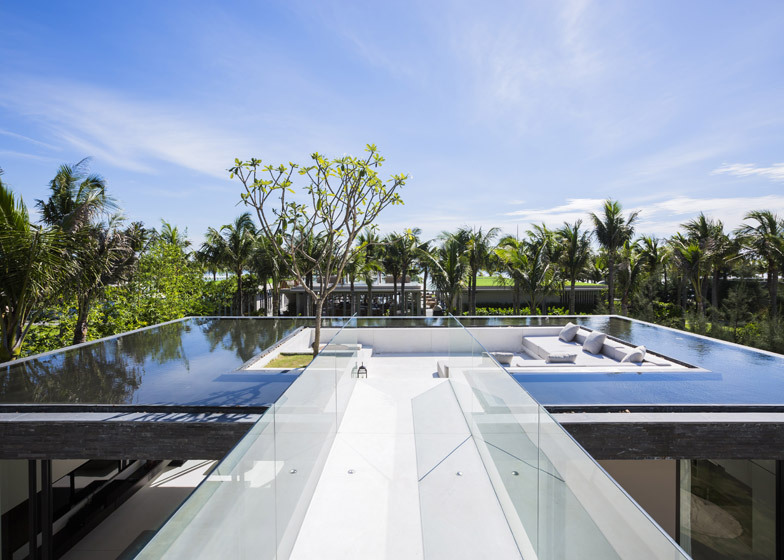 MIA Design Studio has completed another project at the Naman Retreat in Vietnam: a series of holiday villas featuring rooftop pools that surround sunken lounges (+ slideshow). 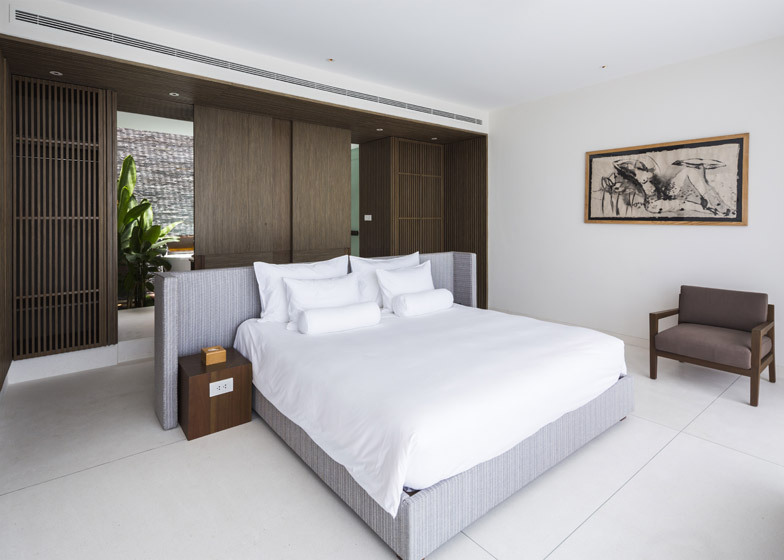 Located on the coastline between the city of Da Nang and the historic town of Hoi An, the five-star holiday resort already features plant-covered day spa and hotel buildings, as well as numerous leisure facilities. 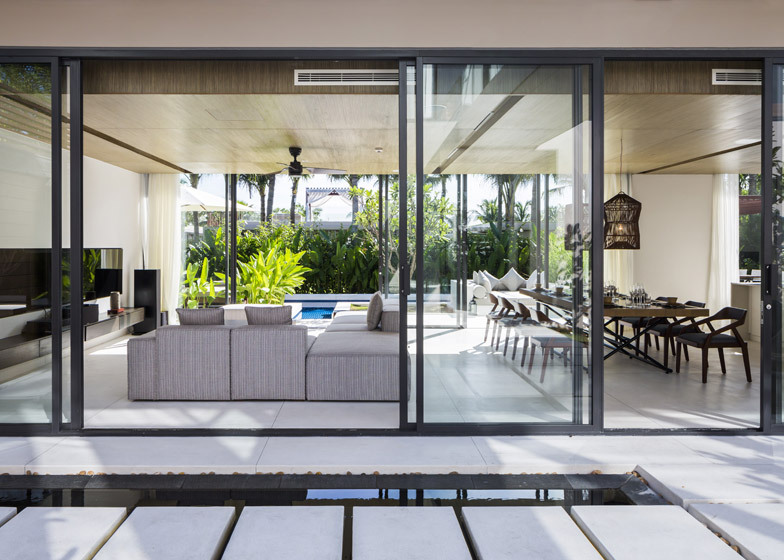 MIA Design Studio was tasked with developing one of four house designs that will make up the Naman Residences – villas that will be put up for sale, but whose owners can offer them up for short-term lets for the majority of the year. Named Garden Villas, this design is a two-storey residence divided up into a large and a small wing. The building's most unusual feature is a shallow pool that surrounds an outdoor living space on the roof of the smaller wing. It is accessed using a bridge that extends across from the first floor of the opposite block. 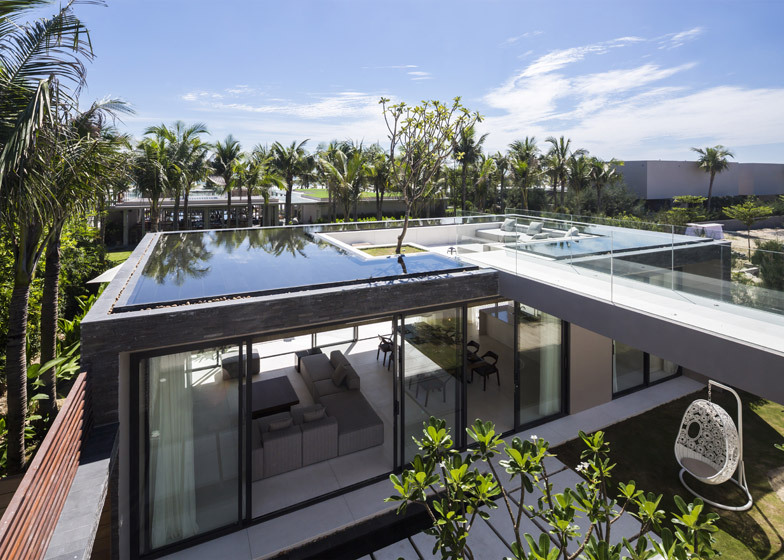 The use of water was an important part of the design concept, according to the architects, and works as a natural cooling system perfectly suited to Vietnam's tropical climate. "We put waterscape into the rooftop of the lower block in order to cool down the whole building and improve the rooftop landscape aesthetically," said the team. There is also a more traditional swimming pool in the garden, tucked away at the rear to offer as much privacy as possible to residents, and a courtyard pool at the centre of the site. 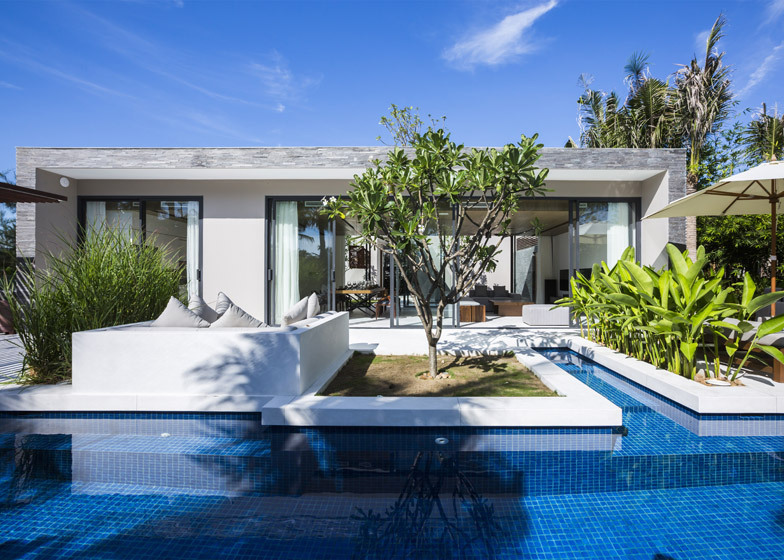 This design also solved another problem – despite being close to the popular Non Nuoc Beach, there are no direct views from the site to the sea, so they client's brief had been to recreate a "beach feeling" in the homes. The larger of the two blocks accommodates the bedrooms – three in total – along with a sauna, bathrooms and storage areas. 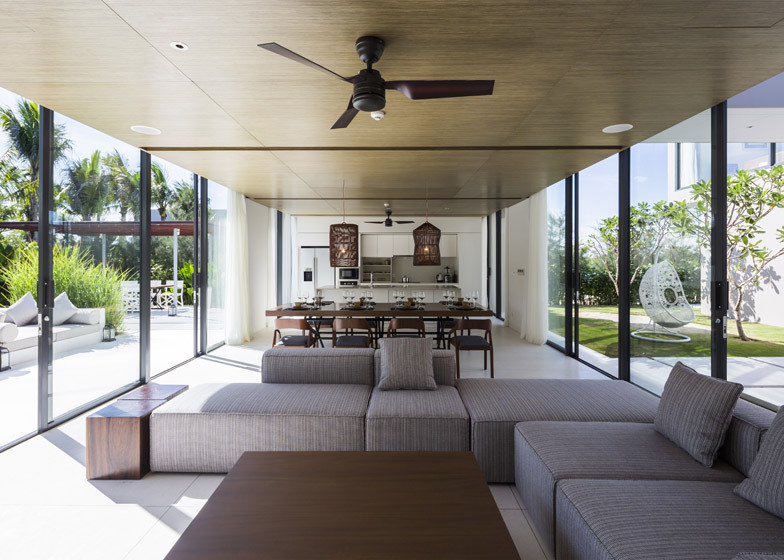 The smaller block contains just one room, a combined living room, dining area and kitchen. "Not too complicated, the design uses the most basic theory of space – creating voids," said the team. "Splitting those villas into two separate spaces: one more quiet and relaxing, with a view to the horizon of the beach; one more functional with terraces and landscapes." 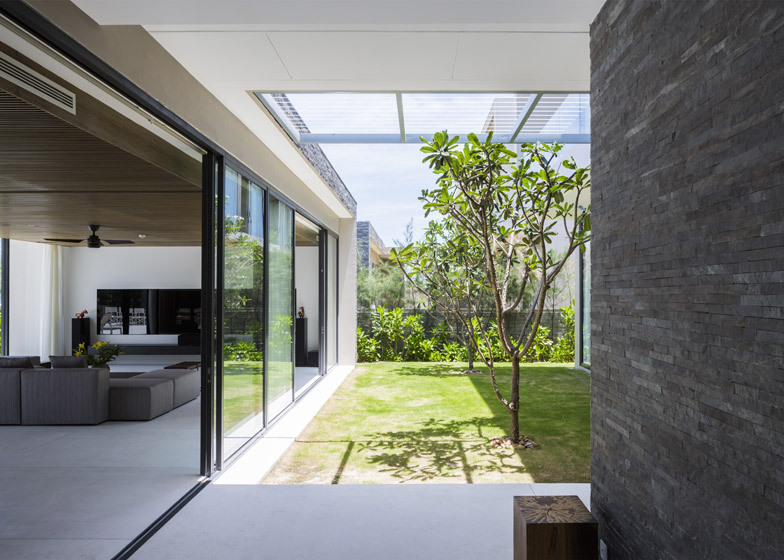 Large expanses of glazing feature on both sides of the house, allowing views between rooms. The rest of the exterior is either rendered white or clad with locally sourced slate. "The design of the house is simple and sleek, so the cost for construction is not so high," added the team. 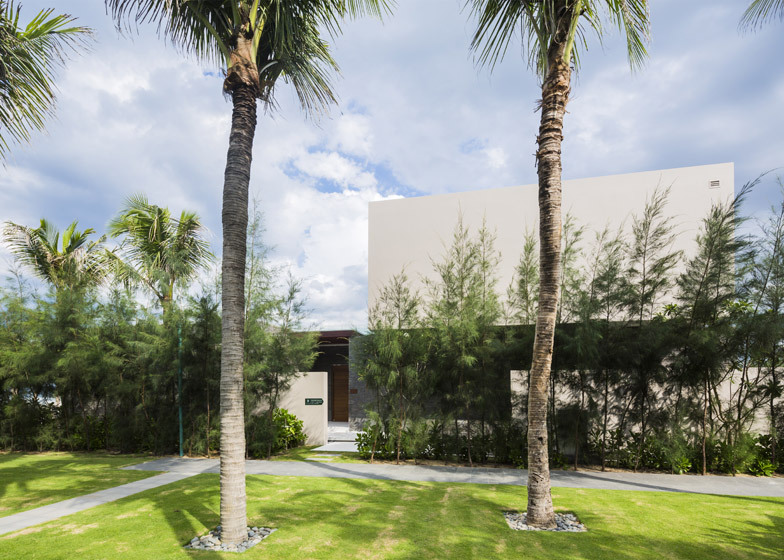 The Garden Villa is the second design for the Naman Residences, following the Beachfront Villa. Two more are also proposed, and all four are intended to be hurricane-proof. Visitor attractions are springing up in Vietnam, as the country capitalises on the growth of its tourism industry. 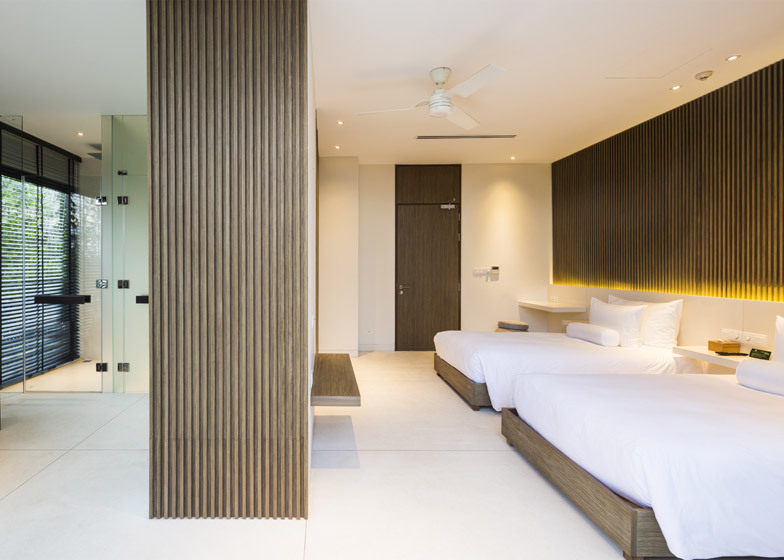 Other recent projects by MIA Design Studio include the Naman Spa and a waterside park in Qui Nhon.